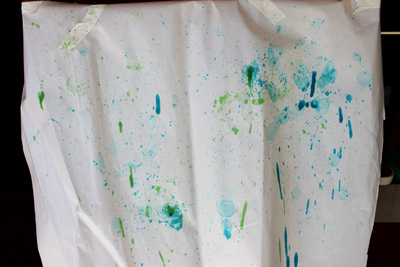 It's not the cleanest kids' craft activity. It's not the most productive kids' craft activity. 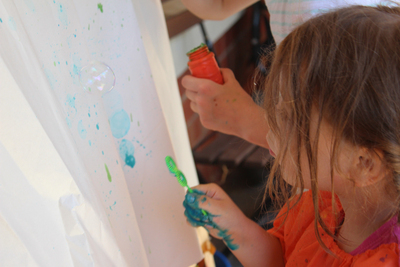 But painting with bubbles is definitely a fun kids' craft activity. 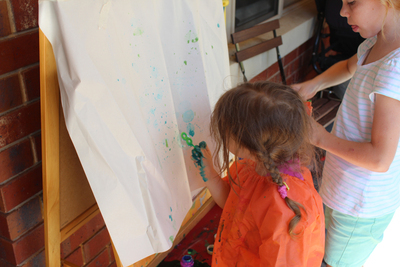 There are a couple of different ways to paint with bubbles, but this one uses the little bottles of blowing bubble mixture that you get from two dollar shops. 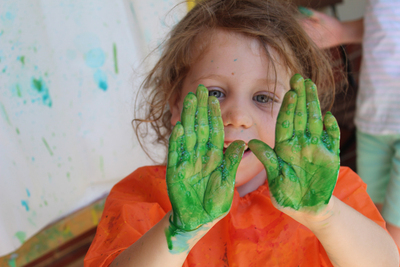 It definitely has the tendency to get messy, so plan for an outdoor activity. Unscrew your bottles of bubble mixture, and add a few drops of food colouring. 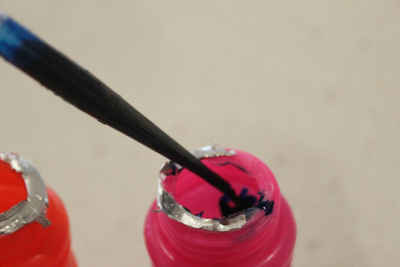 Screw the lids back on, and shake the mixture to spread the colour through. Set up your paper. 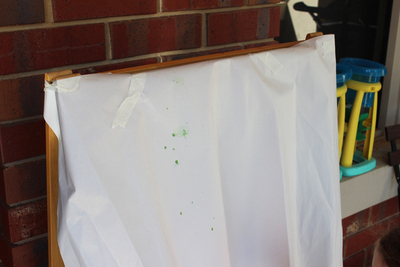 We taped ours to an easel, but you could also just lay some on the ground and blow bubbles over it. Dip the bubble wants into the mixture, and then blow. You'll get a mixture of bubble pops and splatters. When the bubbles pop on the paper they leave a round mark, but when you blow some of the colouring will also splatter onto the paper. It's fun, and you'll always end up with an original and unique artwork. It's definitely quite messy. We found our bubble containers were easily knocked over, and which also meant that Miss 4 had to rub her hands all through the spill. You could keep things a little neater by transferring the original mixture into larger containers that are less likely to tip. Show us what you've created with bubbles!